First things first- what’s with the idiot...you seem to be obsessed by it? Well, Yes. I kinda liked the word ‘idiot’ so much. Keeping aside the literary meaning of the word, according to me, idiots are those guys who do what they really love doing, without really caring what the world thinks of them. They are different, unique and don’t follow the herd mentality. They listen to their heart, follow their mind and carve their own niche, just like the character of Aamir Khan in the movie ‘3 Idiots’. 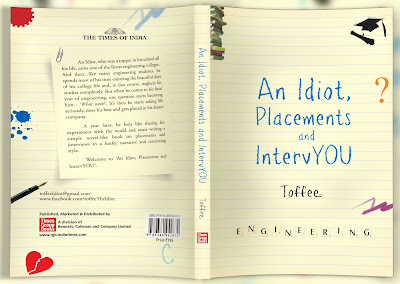 Tell us about your new book- An Idiot, placement and IntervYOU? 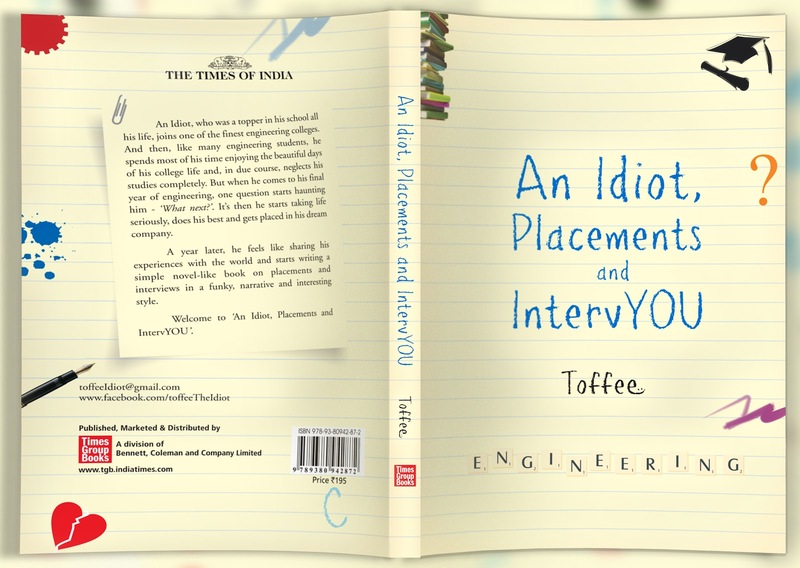 ‘An Idiot, Placements and IntervYOU’ is actually a non-fiction self-help book written like a fiction. It is filled with complete infotainment and is the story of every engineering student. Almost everybody will be able to relate themselves with the ‘Idiot’ of the book. In simple terms, the book is about an average engineering student sharing his journey and experiences in an informal way. Everyone who reads the book would learn something out of those experiences and find them useful in his/her own job interviews. The book is very much like a best friend sitting right beside you and sharing his heart. You say you are a writer by chance not by choice...How does this book came about? What inspired to write this book? Well, I was just another happy-go-lucky guy until I fell in love with a girl. She was my best friend. I proposed to her on one not so fine day and she rejected me. I felt sad and dejected. And I started writing ‘An Idiot, Placements and IntervYOU’ to help myself forget her. So, in short, ‘love’ has inspired me to write this book. Another purpose of reading your book besides the entertainment is the interview knowledge… How do you think it’s going to benefit an engineering student like me? Well, I personally faced a lot of problems during my engineering days because of the lack of knowledge related to the placement process. Of course there were seniors and lectures to guide me and a lot of websites to provide information. But all the information was disorganized, and figuring out what actually was needed would eat away a lot of time, energy and resources. There were books in the market about interviews, but they were too generic and boring. After I joined an MNC, I felt that writing a book on interviews by providing exhaustive and exact information, in an informal way, would be of great help to the students. I deliberately made the book entertaining because I wanted readers to also have fun while reading the book. Bottom line is that one can get lots of information from the book in a very short time, besides entertainment and nostalgia. There are a lot of books available on placements and “IntervYOU’s” as you will say… what’s different about your book? Ans: Every other interview book available in the market is practical and boring. But ‘An Idiot, Placements and IntervYOU’ is completely different. It’s funny, entertaining and informative at the same time. Many a times, the book has emotional stuff that touches readers' hearts. The presentation is different and the style of narration is interesting. Instead of focusing on dos and don’ts, the book focuses on story-telling, there by infusing the information on placements and interviews in the minds of readers subliminally. You are new to the writing field …How does it feel to be called an author, an artist…How as life changed for DELL employee after his first book? I personally don’t see myself as an author yet. I have just shared my life experiences in an interesting way hoping it would help a lot of students out there. I think everyone who read the first five pages of the book would have had tears in their eyes...you are that good at writing emotional stuff…. any plans for an emotional fiction? Well, Yes and No. I do have a good story in mind. It’s just that I am occupied with other important priorities in life and I am not really sure if I would be disciplined enough to attach my bum to the chair and write another book. Let’s see. Only time will tell. You came from a non- writing background..What would your advice be to any young budding writers?